This is a collection of 2,141 records, many only recently declassified, documenting U.S. policy toward Iraq from 1997 through mid-2004. Included is material from President Bill Clinton’s second term, when the overthrow of Iraq’s president, Saddam Hussein, became official United States policy, documents covering the invasion of Iraq in March 2003, and information on the 18 months of direct U.S. occupation. The latter ended during the summer of 2004, when Iraqis technically regained their sovereignty and the Coalition Provisional Authority, set up by the U.S. to administer Iraq, was dissolved. The collection includes documents from the State and Defense Departments reflecting debates within both the Clinton and the Bush administrations about how best to achieve American objectives in Iraq, and discussions from the Bush presidency about tactics for winning congressional, United Nations, foreign, and domestic support for the United States’ decision to invade Iraq. Included are examples of the intelligence reporting that underlay U.S. allegations that Iraq had active chemical, biological, and even nuclear weapons programs, and that Saddam Hussein was operationally linked to global terrorists, including the militant Islamist leader Osama bin Laden. Also available within the collection are examples of assessments championing these claims, and contradictory analyses arguing that the allegations were not confirmed by available evidence. Materials in the set can be used to compare raw and unconfirmed intelligence information reports, finished analyses, and documents that were prepared for public consumption, as the White House sought partners for the regime-change policy it had elected to pursue. Lays out details of Interagency Transition Planning Team's strategy for Iraq's reconstruction and establishment of U.S. mission. 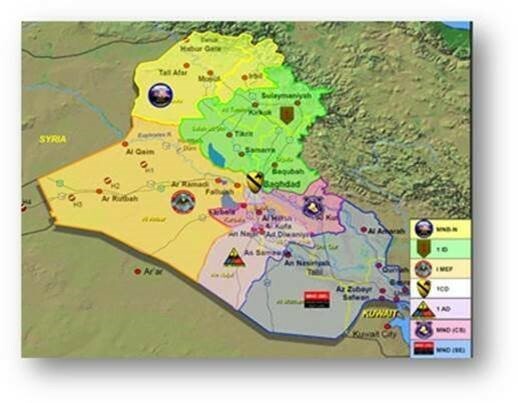 Map of coalition bases in Iraq, 2004. The primary value of this collection is as a detailed record of the lead-up to, and initial phases of, the Iraq war, one of the most consequential events of recent history—for the United States, for Iraq, for the Middle East, and for the international community. Epitomizing its historical significance is the fact that the invasion of Iraq is often characterized as the worst foreign policy mistake in modern American history, one that produced long-term catastrophic consequences for Iraq and for the United States and contributed greatly to the seemingly endless regional instability and cycle of violence that followed. Information in the collection will also be useful in examining an issue of continuing concern: the politicization of intelligence to serve political ends. In this case, the George W. Bush administration was resolved to invade Iraq, sought evidence that could be used to justify doing so, and found ways of obtaining it. When the information provided by intelligence agencies, including the CIA, was insufficiently compelling the administration obtained the evidence it sought from alternative sources. The documents in this collection also demonstrate the symbiotic relationship between policy and promotion that dominates our perception of world affairs. The United States presented its case for war in the most persuasive light possible and successfully orchestrated a campaign to market the invasion of Iraq. The public, press, congressional, and, to an extent, opposition party skepticism required for an effectively functioning democracy was lacking during the lead-up to the Iraq war – despite a vibrant global antiwar movement. The result was a conflict that turned out to be nothing like what had been advertised, resulting in death and injury on a grand scale, trillions in costs, and the subsequent instability and rise in extremism predicted by war opponents. As of this writing, 14 years after the United States invaded Iraq, the conflict continues.